Traditionally marked with a cross made from pastry or cut into the dough, these lovely rich fruit buns are eaten on Good Friday. You could try grinding the spices yourself for a stronger flavour. Mix butter and milk and warm until the butter has melted. Add the yeast and sift the flour, salt and spices into a bowl. Add the currants and peel and stir to ensure they are well coated. Add the sugar. Stir in the liquid and beaten eggs to form a soft dough. Turn onto a well-floured surface and knead for 6-8 minutes until smooth and no longer sticky. Divide the dough into 12 and shape into buns. Place the buns well apart on greased baking tray. 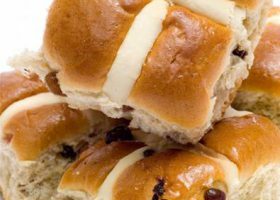 To make crosses, slash the buns with a sharp knife or use thin strips of pastry or pipe on crosses using a paste made from 2tbsp each of plain flour and water. Cover the buns and leave to rise in a warm place until double in size - about 1 hour. Bake in a hot oven, 200C/gas 6 for 15-20 minutes until golden brown. Brush hot buns with a sugar/water syrup.